From the New York Times bestselling author of Bitter Blood, comes the story of a greed so powerful it led to an unspeakable crime. Wealthy Lieth von Stein lay dead and his wife Bonnie near death in their North Carolina home after a vicious assault with a knife and baseball bat as they slept. The crime seemed totally baffling until police followed a trail that led to the charming von Stein stepson, Chris Pritchard, and his brilliant, drug-using, Dungeons-&-Dragons playing friends at N.C. State University. 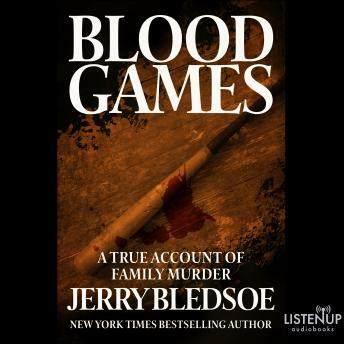 Blood Games is the shattering true story of degraded young minds-and a son's gruesome greed turned horrifyingly real. Jerry Bledsoe masterfully reconstructs the bloody crime and its aftermath, as he takes us on a riveting journey into the secret twisted hearts of three young murderers. Narrator's voice is just okay. I wouldn't want to hear him read again.